Home State: California, but I was a Navy brat. That means that we moved a lot. Years traditional bowhunting: I flung my first arra at a critter, a crow, thirty-two or three years ago. But that was before I knew anything about hunting, seasons, licenses, and all that. For real with a license and all that hunting? Maybe twenty years. Serious for dead sure real not just taking the bow for a walk-type hunting? About ten years. (Killdeer)- And destroy the Mystique? I have led an interesting life. We traveled to Hawaii and Japan in my early years, and I guess that started my interest in different cultures, different ways of doing things. I knew from the get-go that ours was not the only way to do things. I question everything. I question everyone. I question myself. As a result, I can see many sides to the same question, and many answers. And so I am confused much of the time! I have a ton of hobbies, which I pursue to a high level of mediocrity. I see stuff and want to try to do it, or make it, and figure it out as I go. When I was growing up, there were a lot of things that I was told I could not do, or conversely, had to do, because I was a girl. I have spent a goodly amount of time and energy doing what I wanted to do, as well as I was capable of doing it, gender roles be damned. I have no patience with hobbles, whether self or societally imposed. As human beings, we all have the responsibility to ourselves to strive toward any goal we feel worthy, and as long as it is legal, no-one should tell you that you shouldn't. If it SHOULD be legal, then you should fight to make it so. I have bucked a lot of trends, and as a result, I feel that I have developed into the honest me. (Killdeer)- Traditional bows are all I have owned. (Killdeer)- I have a lot of heroes, including my husband. They all have one thing in common. They seek the truth, and hold fast to ideals. They respect others' right to do the same. (Killdeer)- A friend of mine gave me his bow, a Bear Grizzly at 55 pounds. It was work, but I could shoot it. I was gun hunting already, and this gift from the past led me into the woods early one year. (Killdeer)- The first year I took off to go hunting in the mountains, I had a '66 Dart and a week of vacation. I was chock full of ignorance and dreams, and I packed a pup tent, a Sterno stove, some candles and foodstuffs. I got to the spot that I had picked out on the map, and there was a big sign there that said, "NO CAMPING". It was all straight up and down anyway, so I bumbled on down the barely paved road. I had to rehang my muffler twice, and it was sleeting. I took endless dirt and gravel logging roads, and came to an intersection where there were some campers sighting in their muzzleloaders. I pulled up to a fella whose trailer was hiding the roadsign, and asked where I was. He replied, "Yeah, the campground is thataway, but you don't wanna go down there little lady, that place is full of hunters!" The hunters were indeed thick down there, but it was getting dark. I put up my tent in the only area I could, kinda in a drainage... the next morning, my water bottle was frozen, my sleeping bag was definitely TOO light, and when I sat up, my head scraped frost off of the tent wall into my lap. I have been hunting there ever since. The population of hunters has thinned (grin!) and I have learned how to keep a cozy camp. The one time I got snowed in, I had plenty of propane, a running spring, and a six-point buck hanging from the pole. The car did not leave camp for eleven days, and it was an experience that I will always savor. I was stillhunting a jeep trail one morning. And kinda scouting, multitasker that I am. Up on the knob there were tons of in-your-face buck rubs, one on a striped maple 3" in diameter. I moved slowly, perusing and surmising, musta come from...went there...and four deer came down the ridge across from me. I watched as they made me, boresighted me for five minutes while I held still as the maple. Then they vaporized. No panic, no running, no whuffing. They just disappeared. From my left approached two deer, in that careless floppy-eared walk that we should see more often. Stealthy me, I was standing, bent at the waist, in the middle of the jeep trail. I knelt. The deer came on. Fawns. The first one saw me in the middle of the trail, looking stupid, and so she started the "What Is It?" dance. Great. Here I am, The Mighty Hunter, now a plaything for kids.I stayed still, and they relaxed and approached. The leader stepped onto the trail, she looked in range, and I am thinking hard. They probably smelled clutch burning! She looked away. When God sends you a gift, it is not considered good form to quibble about size, so I drew and shot. This was the first arrow I ever launched at a deer. It was homemade of ash, fletched with wild turkey from these mountains, and tipped with a stone point that I had watched Ed Wentzler knap at Baltimore some four years earlier. I had carried that arrow all those seasons in between. It zipped straight toward her heart. I have learned that it is best to take a shot at a deer that has not seen you. If you have seen their eye, they have seen you, whether they show it or not. They know you are there and are alert inside, while their outside shows no sign, so as not to trigger our primitive chase instincts, don'tcha know. This one had seen me, and shown it, so I can't pretend that she hadn't see me. So she heard the thump, and spun around to exit stage left. To do that, she dropped her right shoulder, the one on my side, and swung her head toward me so as to start flowing back the way she had come. She is now looking at her backtrail, and pushing with her haunches, pivoting on her right hind foot, and the arrow smacks into the back of her neck, about four inches from the base of her skull. She launches into a floundering cartwheel, falls on the arrow and breaks it. Her sibling tore across the trail and up the knob, out of sight. I readied the second arrow, a clear obsidian point with a black streak of lightning through it, and looked for my next shot. She lay on her side, legs running.I waited, hoping she would quietly expire. Each time I thought she was done, she would blink, or her lungs would heave, and she would kick. Keeping out of her vision , I quietly snuck up and put another arrow into her chest. She sighed then, and died. I wept then. I wept for how long it had taken her to die, (It seemed like forever, but was only a minute or three. Time goes funny in those situations.) for gratitude in being given her, for the four seasons that I had hunted with that arrow. I gave thanks, and got her ready to travel. As I started the drag, I gave thanks that it was a small deer. It was sprinkling when I dragged her into camp 40 minutes later. The game warden likes to come visit me, and we chatted the next day as I processed the meat. I showed him the bones, a neck and a thoracic vertebra that had holes in them from the stone points. He is a warm and likeable person, and has a lot of knowledge about the country I hunt. I try to get him to tell me more, and I think he likes the crazy gal that deerhunts with an old fashioned bow, and older fashioned arrows. (Killdeer)- I have been using a 47 pound Jeffery, 52" recurve. I use home made ash arrows, and stone points held on with deer sinew, which I waterproof with a mixture of pine pitch and deer tallow. I have a Quickie "Kwik Three" bow quiver on the bow. I am thinking about switching to a longbow, and have a couple of Morrisons standing ready. (TG)- What is the one piece of advice you would give a new hunter to aid him or her on their hunting ventures? (Killdeer)- Learn to laugh at yourself. We hunt these animals not just for the meat to feed ourselves, but for the challenges that feed our spirits. We hunt them because they are good at what they do, and when they do it, you are going to look REAL funny! Might as well laugh, because your laughter must also contain your admiration for their abilities, and those of the One who made them. When you are freezing your rump to a log in late season, go ahead and say that you are cold. And remember how well-made and tough these creatures are who will stay out all winter. Slap skeeters and wonder how the fawns survive the hurricane season, or where the deer go during a tornado. For all our accomplishments, these animals have abilities that put us to shame. Laugh at yourself, and respect the game and their world. (Killdeer)- I like to stillhunt. Yeah, I get busted, but I don't get bored. When I sit, the mountain air currents start swirling, and so does my brain...I should be closer to the cover...now the wind is wrong...I can't shoot from here. I think myself out of every spot I find. Since I am moving anyway, let's call it stillhunting! Stillhunting lets me see what is happening over the next rise, or down the next hollow. If a place feels good, I will stand and watch it for a while, if not, I will ease on. It is fatiguing, mentally, creeping so slowly with all your senses on, so I take breaks, and then off I go. I get to see more of the area, too, see where the mast is good, how the sign is in the old familiar spots. My hunting area is four hours away, so I can't really scout until I am in deer camp. I carry my bow scouting the first couple days, and slow WAY down in the good spots. For all my hunting, I am always on the ground. (Killdeer)- My family was just not into it. There were no weapons in the house, except my father's Navy sword. My great, great, great grandfather was a hunter and a woodchopper who lived in the "Bear Swamp" outside of Princeton, NJ, and my grandfather rode to the hounds, my dad fished a little, but not with me, and that's about it, that I know of. My husband started going out hunting with me, probably to see more of me, likes to squirrel and deer hunt, and uses a rifle. He enjoys going to shoots with me, and has some neat bows. (TG)- What or who first got you involved in traditional bow hunting? (Killdeer)- It is something inside, I guess. Hunting is a very spiritual thing for me. When I was growing up, there always seemed to be somewhere that I could go to explore Nature. When I got into trouble, it was usually because I would forget the time and be gone long enough for my mom to worry. I was allowed to have a bow at eight. At thirteen, I read "The Archer's Bible", a new book by Fred Bear. I shot at my first critter (a crow) at 16 or 17. I knew nothing about hunting, seasons or anything. At that age, one is so sure of what is right, and just, and noble, well, I was a complete snob. I hated gun hunters, it was just too easy, and had wiped out the passenger pigeons, dodo birds and nearly erased the buffalo herds. I was sure of my superiority, and knew that I was perfectly correct in launching that shaft. I knocked a tail feather off and lost my home-made "bird bolt". I shot targets only sporadically until my late twenties. Emerging from my years of hormonal insanity, I got married. Soon after, I bought my first real firearm. (hee hee) I figured that I might want to hunt someday, so it was a 700 classic in .270, with a Leupold 3-9 on it, offa the used gun rack. This is what I learned to deer hunt with. Then I built a custom 7mm-08. I started muzzleloading,,,this IS a slippery slope, isn't it! I went to an outdoor show, and found a couple of vendors with traditional bows. Trad is all I knew. I saw a bow, it was the first one I had ever seen with clear glass on the limbs, and I loved it! Red elm, the fella said, and made by Owen Jeffery. His tale went on, but I was in my own little world as I drew it. It was heavier than I was used to, and between being embarrassed at how my arms were shaking and wondering where I had heard his name before, I didn't listen so well. I bought the Mighty Mag Classic right there, thinking that this was the path I wanted to set out on. I made the check out to one Howard Hill. No, not THAT one, but it did have me scratching my head for a bit. (Killdeer)- I want to kill another deer. (Killdeer)- I make my own strings and arrows. I use manufactured dowels, but have a stack of river cane in the corner of the living room. My now-famous quiver was made from a jeans leg some seven or eight years ago, as a prototype. I am making another...as you can see, my rate of production probably falls below the median. (Killdeer)- Hard question. I guess it would be My Place. Somewhere that doesn't get touched by anyone but me and mine. A place that I could throw my heart into, that would never be taken away, and I could wander undisturbed. It is always jarring to me to be out in the woods, creeping along, all senses on FULL, and have a stranger appear. The rhythm is gone, the animals all change course and behavior, and my communion with the land is disrupted. I would really like to hunt a place that I knew intimately, and knew was unpeopled. (Killdeer)- I hunt public land. (Killdeer)- I love the mornings, and usually stay out all day. I am too lazy to go back to camp just to eat and lose two hours of hunting time! Evenings with a bow end pretty early, as I don't want to have to worry about tracking in poor light or leaving an animal out overnight. I am usually pretty tired by then anyway, and there are a lot of chores to do before I can turn in. (Killdeer)- I used to do all that scent control stuff, but I just use a scent control soap on my clothes and for washing now. Doing laundry in a public machine makes it impossible to keep all the brighteners and scents out of your clothes anyway. All I can do is smell like a really clean human. Then, after a night in a sleeping bag, what have I accomplished? I will sometimes spray down with an eliminator, but I doubt the effectiveness of them. I would rather roll in dead leaves and deer beans, rub spruce on my clothes, those scents I believe in. But the human in a person will seep out, so I watch the wind, and obey its whims. Most of my clothes are camo, and some, like my vintage wool pants, are not. I think motion attracts more attention than whether you are wearing plaid or stripes. I try to avoid the "blob effect" that solids give, though. 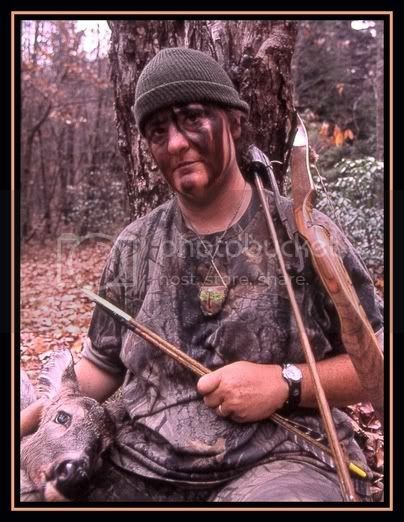 I believe I have had success in using a doe in rut scent dragged along a ridgeline, as a few times I have laid the line down in the morning and hunted the ridge in the afternoon, and had bucks walk that line with their heads down and their noses working overtime. But that technique is for stand hunters, so I use it in the gun season when my backside is planted at the base of a comfortable tree. (Killdeer)- I love to squirrel hunt. I am deadly with head shots with a .22, but they jump out of the way of my arrows every time! Even very close-range squirrels are a foot away from where they were when I released! I think I should take long shots. They will hold still just to mock me, and I might luck out! I laugh a lot when I squirrel hunt! (Killdeer)- I have a lot of dreams, but I am getting old and arthritic. Horse packing up into elk country comes to mind. Any hunting in the Paha Sapa would be very special indeed. Alaska...is there anything more dreamlike than Alaska? Texas snakes and scorpions and zillions of stinging prickly things don't scare me (much..), but illegals do. Hunting the deep forests that Glenn St. Charles stalked...and I am still just in North America! But I really like chasing the Virginia whitetails. (TG)- How did you become "the" Chatter Member? (TG)- You post some pretty nice pictures, What kind of camera are you using? Most of my posted pics are taken with a digital compact, a Canon S-60. It's a 5 MP camera with a zoom lens. Some of the pics were taken with my Canon Eos Elan2E 35mm. I scan the slides on my flatbed, and go from there. The digital has been a liberating experience, as it is light to carry, and as I am not using a tripod (that shows, here and there, as a soft exposure) I can reach it out and hold it where I couldn't get the big rig. Sometimes it works real well, but I cull a lot of pics where the camera focused on the wrong thing. I don't mind culling, since I am not paying for processing. I call the digital my "free camera"! One of these days, I hope to read the instruction manual, and learn how to use it. And also, I would like to know how to scan the right size files for different applications. Numbers make my brain glaze over, but I would like to know at what resolution I should be scanning slides, and how to work with RAW data. (TG)- What can some of us guys do to help get the girls interested in traditional archery? (Killdeer)- I think Traditional archery has the edge over more technically-focused forms when it comes to women. Hmm. Here I am discussing women, and guys, I just don't understand 'em! But the trad bows are more beautiful, easier to understand, lighter in the hand and generally less gnarly and macho looking to the beginner. I liken it to the difference between a horse and a dirt bike. Archery has always been a women's sport. It is a goddess, Diana (Artemis) who wields the bow and blesses hunters. Elizabethan women frequented the butts, and in America, in the early 1900's one often found women engaged in this "most healthy excercise". In the fifties or sixties (time has become a blur to me) one of the "Beautiful Breck Girls" was an archer. Archery was a staple of women's phys-ed courses. For the life of me, I don't know why more women don't shoot, unless it is because of two factors. The first, and I am speculating here, is that it takes considerable motivation for the majority of the population to get to a place where they can shoot. Most of America's population lives in urban areas. When you don't see folks shooting, you don't think about it much, and then when you do, it's brief, because you can't picture how you would be able to do it without the physical space. The second factor, and it is connected to the first, is that most women don't have an interest in hunting. (Like I said, I just don't understand them. Matter o' fact, most things they are into just make me roll my eyes and reach for a beer.) People who hunt are just that much more motivated to shoot. Hunting isn't all there is to archery, but I believe it is a much more powerful motivation than racking up X-rings. How can we get more women shooting? Stop dating froofy girly girls, guys. You are breeding shooting out of the human gene pool. But you won't listen. Interviewers notes: I guess you can tell by the length of the interview why she is the only "chatter" member we have! She really gave me grief over the comment about having "nice" pictures. She doesn't know me very well or she wold have realized that was a huge compliment coming from me. I really enjoyed this one. Thanks Killy and good luck on the hunt you are currently on!